”Any Specific keywords on any search engine result on the top on foot to bring your site to the search engines are known as SEO” The keyword helps to show your site on top on the search engine. 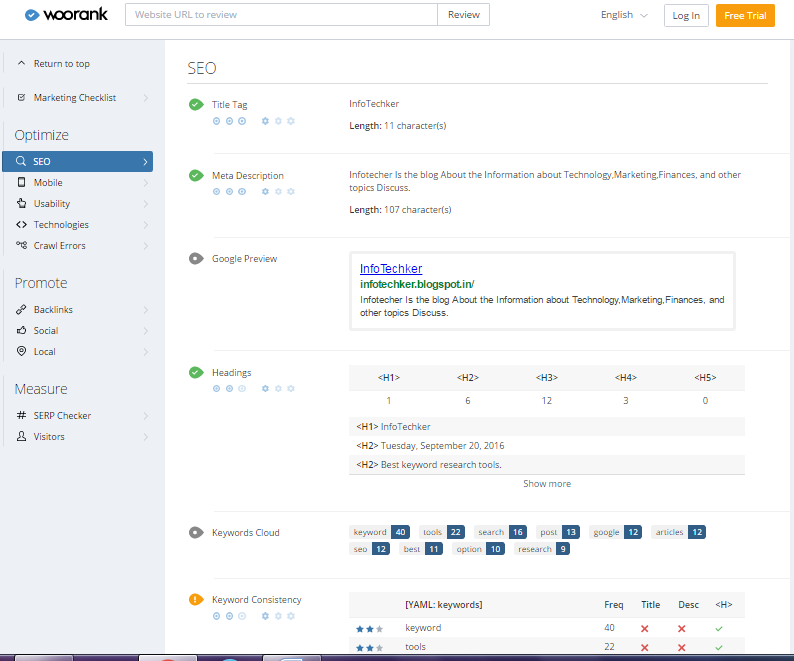 Woorank completely reviewing On page SEO for your website, on-page it’s mean making website batten with following the Search engine optimization rules. Then adding your website in review box on top the woorank show following result. You can use this tools just add your site link and click to review button you can make free account also for more future. In my site result woorank show 69.5 % pass for SEO rules, show error on my site and also show my site need an improvement for some. Woorank has shown all tags improving result on footer less we show. woorank show your web site title character length , and show Make your title tags clear, concise (50-60) and include your most important keyword . Woorank shows how your site show on Google search result , you not include title and descriptions search engine may create their own . its importance to always add meta title and description on site or post. woorank show your website headline Structure using HTML headline <H1> to <H6> Use your keywords in the headings and make sure the first level (<H1>) includes your most important keywords. Never duplicate your title tag content in your header tag. While it is important to ensure every page has an <H1> tag, never include more than one per page. Instead, use multiple <H2> – <H6> tags. Keyword Cloud provides an insight into the frequency of keyword usage on the page, in any website using the maximum keyword with following the search engine guideline Use only max 10 keywords is called Keyword Cloud and use more than 10 they call Keyword Stuffing. its show your website keyword frequency and show where you using this keyword in your title, descriptions, and H1tags. Woorank shows you site Mobile view and load mobile speed time and analyze is good or bad for a visitor, check your site is mobile friendly or not. The backlinks score is calculated by looking at a combination of signals. This includes the overall number of backlinks together with the number of linking domain, as well as rating overall quality of the backlinks pointing to a website. The quality assessments are based on the linking pages. in this woo rank show how many images in your site and how many images you can include ALT tag. This ALT text also helps makes an image more likely appear in a Google images search. Try to minimize the number of alt text characters to 150 or less (including space) to optimize page load time. WooRank can be check Robot.txt file is available on your site and it’s Allow in Google webmaster tools its shows all error about your robot.txt. Woorank shows you can use www redirect or not if you use they show green icon then you not be set so wooRank shows error in this section. It’s the most importance for indexing your site for any search engine that is most Importance to use it’s for Google crawler index each and Avery content on your site Woorank shows you added or not added XML sitemap in your site . Tools show about broken links, www redirect , Robot.txt file, Sitemap.xtm file, Social media Account, visitor Avery thinks you can use this tools and check everything for your website and improve its . tools can help, we get an idea and work our site to improve and make better for SEO guideline for show top result on search engine .